Of all the recent advocates of cognitive and neural enhancement, John Harris must be the most forceful and provocative. A philosopher and lawyer based at the University of Manchester, Harris certainly knows how to push hot buttons, and when it comes to the ethics of enhancement, hot buttons are never in short supply. There’s a wonderful undercurrent of braggadocio in Harris’s writings on this issue. The structure of his arguments, and the tone in which he conveys them, always gives me the impression that he is practically begging the reader to oppose him, because then he could ask them: Are you so stupid and obtuse as to think that enhancement is a bad thing? I want to give readers of this blog a flavour of Harris’s arguments in this post. Harris’s main case in favour of enhancement is contained in his 2007 book, Enhancing Evolution , but here I’m going to focus on the shorter version of this case which is presented in Harris’s contribution to the recent Oxford Handbook of Neuroethics . Harris titles his contribution: “Chemical Cognitive Enhancement: Is it Unfair, Unjust, Discriminatory, or Cheating for Healthy Adults to Use Smart Drugs?”, which seems to suggest an ambitious agenda for a ten-page article. Suppose a university, perhaps the famous Ritalin College in Virginia, were to set out deliberately to improve the mental powers and capacities of its students; suppose its stated aims were to ensure that the students developed enhanced executive function, enhanced study skills, and improvement in the focusing of attention and in the manipulation of information. Suppose that a group of educationalists had actually worked out a method of achieving this, in the form, perhaps, of an educational and physical curriculum. What should our reaction be? Should we welcome such a breakthrough? Would we want to send our own children to this famous seat of learning? And if Ritalin College was too expensive would we be anxious for our local college to adopt the same revolutionary methods? I say this is rhetorically well-conceived because, of course, it's not really a thought experiment at all. Thought experiments are supposed to detach us from reality and force us to journey through our imaginations to fanciful and abstract locations; but places like Ritalin College — apart from the ridiculous name, are very much a feature of our reality. They are the elite universities scattered all over the world. The places where we very much do wish to send our children despite their expensive tuition fees. But by presenting it as a thought experiment (with its numerous “suppositions”) Harris encourages us to sneak up on our own value systems. By the end of the paragraph quoted, he expects us all to have that “aha!”-moment when we realise that we are, in spite of ourselves, generally in favour of cognitive enhancement. Once he has made us realise how much we value cognitive enhancement, he springs upon us a series of rhetorical questions: If the goal of enhanced cognitive functioning is something that we might strive to produce through education then why should we not produce these goals, if we can do so safely enough, through enhancement technologies or procedures including chemical cognitive enhancers? And if enhancement is a legitimate aim for educational science, why would it be an illegitmate aim for medical or life science? Harris’s preferred idiom is that of the rhetorical question; my preferred idiom is that of the formal argument. 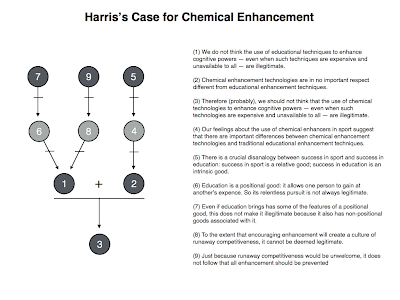 So I’d like to take Harris’s questions, combine them with his original thought experiment, and craft the following analogical argument in favour of chemical enhancement. (1) We do not think the use of educational techniques to enhance cognitive powers — even when such techniques are expensive and unavailable to all — are illegitimate. (2) Chemical enhancement technologies are in no important respect different from educational enhancement techniques. (3) Therefore (probably), we should not think that the use of chemical technologies to enhance cognitive powers — even when such technologies are expensive and unavailable to all — are illegitimate. I like to think of this as Harris’s core argument for enhancement. But as it happens, Harris is not particularly wedded to the education example in premise (1). He uses other analogies to support his basic case for chemical enhancement when necessary. We’ll consider these as we move on now to see how Harris fends off the attacks on his core argument. One way in which we can challenge Harris’s core argument is by coming up with a counter-analogy. The counter-analogy will make us think twice about the desirability of chemical enhancement. One such counter-analogy can be found in the use of performance enhancing drugs in competitive sports. There is general agreement that there is something unsavoury about the use of such enhancers. Weren’t we all slightly aggrieved when we found out that Marion Jones took performance enhancers? Wouldn’t we look down Lance Armstrong’s achievements if it turned out he had been blood doping all these years? I know I would. As an Irish person, I distinctly remember the feeling I had when I learned that our Olympic gold-medal winning swimmer, Michelle Smith, had failed a drugs test. Everything she had achieved suddenly became tainted. But if this is how we feel about performance enhancers in competitive sports, then we have to ask ourselves the question: wouldn’t we feel similar if we learned that the excellent results of our child’s exams were won through the use of chemical enhancers, and not through hard work and perseverance? Wouldn’t we think they had cheated? In other words, don’t we have reason to reject Harris’s putative analogy between traditional educational techniques for enhancement and modern (largely still speculative) chemical enhancement methods? (4) Our feelings about the use of chemical enhancers in sport suggest that there are important differences between chemical enhancement technologies and traditional educational enhancement techniques. Harris has a response. There is, he says, a crucial difference between success in sport and success in education. Success is sport is a relative good: your success in a sporting contest can only be measured in relation to a set of arbitrarily-defined rules. Success in education is an intrinsic good: it is good in and of itself, not relative to some set of rules. Thus we can feel comfortable in not allowing sprinters to use motorbikes to get them from A to B. That after all is not the point of sprinting. But we can’t feel equally comfortable about preventing someone from improving their computational skills with chemical assistance. Arbitrary restrictions of that sort seem out of place when the outcome is intrinsically good. (5) There is a crucial disanalogy between success in sport and success in education: success in sport is a relative good; success in education is an intrinsic good. There is a second challenge to Harris’s core argument. This one claiming that success in education is not an unqualified good because it always comes at the expense of someone else. This is the positional goods argument. A positional good is one that is only valuable if others don’t have it. Once everyone has it, it loses its value. Education can be viewed as a positional good because it is sometimes only valuable to you because other people don’t have it. For example, in the case of a competitive job interview, an education can be valuable if it marks you out from the other interviewees, but it becomes less valuable when everyone has one. The positional goods argument is effectively a challenge to premise (1) of Harris’s core argument. It is not just an objection to the use of chemical enhancement, it is an objection to the current system of educational enhancement tout court. (6) Education is a positional good: it allows one person to gain at another’s expense. So its relentless pursuit is not always legitimate. The obvious response to this is to argue that education is not a positional good; it is something from which we can all gain (a non-zero sum game, if you like). We all benefit from having a few extremely intelligent people around who can discover antibiotics, sequence the human genome, invent computers and so on. Interestingly, Harris doesn’t opt for this obvious response. He tries to argue that even if educational enhancement has some of the features of a positional good, it is still a legitimate aim. He uses several analogies to make his case (advent of artificial light; kidney transplants; development of a CV). Of these, the CV example seems like the strongest. He points out that while CVs certainly have their competitive uses, the events they record are not solely valued for their competitive uses. A CV records selected highlights from an individual’s life, highlights that were valuable in their own right. So, for example, I didn’t get a PhD simply because having one would be of benefit on the academic job market; I got one because I wanted to learn more about a particular topic and to make a small contribution to the great intellectual commonwealth of human history. Was my getting a PhD illegitimate because it also conferred some positional advantages? Harris would say no. (7) Even if education brings has some of the features of a positional good, this does not make it illegitimate because it also has non-positional goods associated with it. There is a final worry about enhancement technologies. This worry once again concerns its potential uses in competitive contexts. But this worry is not concerned with competitiveness simpliciter but, rather, with the potential for “runaway competitiveness”. The argument here is that chemical enhancement will cultivate a hugely competitive culture. Everyone will become obsessed with improving themselves, and will have no time to be happy with what they’ve got. What’s more, once the enhancement ethos gets a foothold, we will start to expect — demand? — that others enhance themselves. Do we really want to be the midwives to such a culture? (8) To the extent that encouraging enhancement will create a culture of runaway competitiveness, it cannot be deemed legitimate. Once again, Harris has a story to tell. This time the story concerns a young surgeon who performed the worlds first xenotransplantation of a liver. The patient who received it lived for 72 days. And for every night on those 72 days, the young surgeon slept in the room next to the patient. I’m sure we all think that this dedication to the patient is commendable, above and beyond the call of duty. We wouldn’t like to demand it of everybody. But at the same time, would we like to prevent the young surgeon from being so dedicated? Probably not. 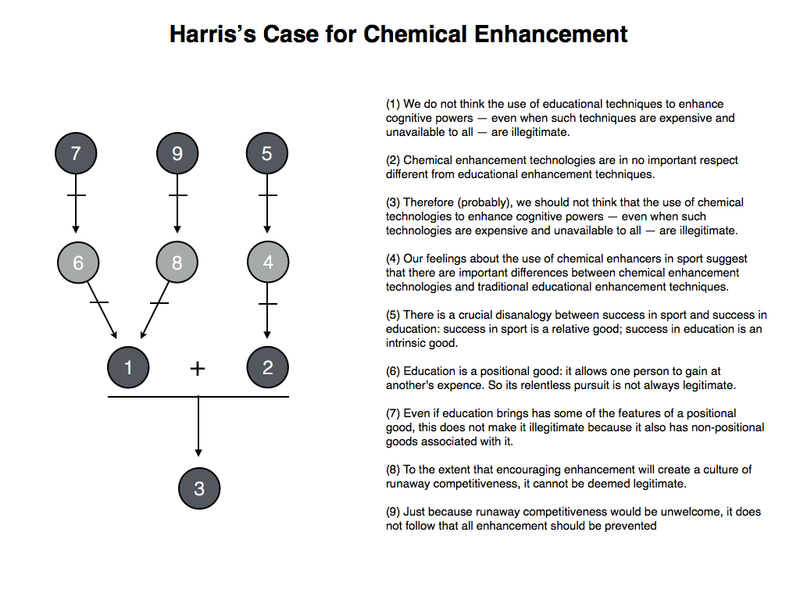 Harris thinks the same reasoning applies to the enhancement context. Just because runaway competitiveness would be unwelcome, it does not follow that all enhancement should be prevented (call this premise 9). This then brings us to the end of Harris’s basic case for chemical enhancement. I’ll no doubt write more about this topic in the future.